We will let you in on a little secret... a trick that enables you to prepare lip-smacking Thai Peanut Sauce within minutes using peanut butter! 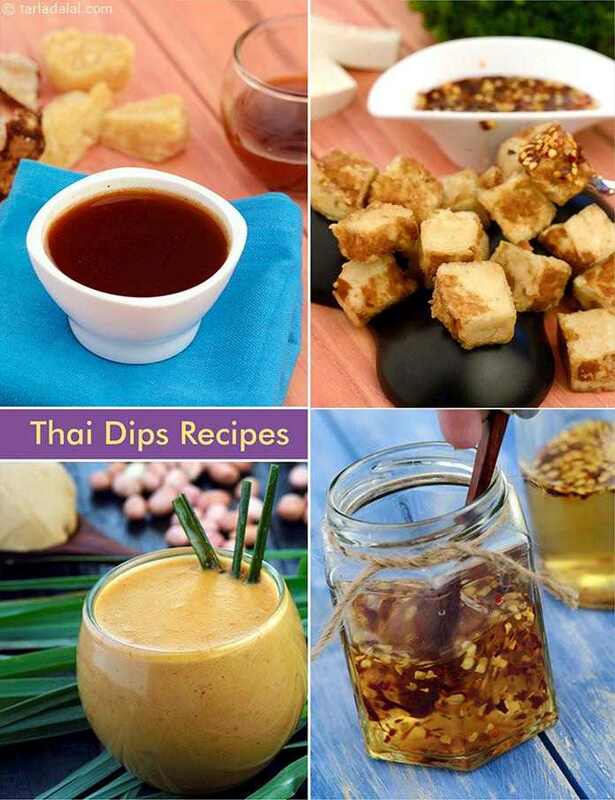 Here, peanut butter is combined with coconut milk and typical Oriental flavour enhancers like garlic and lemongrass, to prepare a luscious and intensely tasty sauce, which can be used to make innumerable Thai delicacies. A dash of brown sugar enhances the flavour of this sauce remarkably, so forget it not. Also, take care to cut the lemongrass into three large parts, so that you can easily remove and discard it after cooking. Ready in minutes, the Hot and Sweet Dip is made with chilli flakes and vinegar sweetened with sugar. A pinch of salt helps to highlight the other flavours, and must be added without fail. Remember to allow this dip to soak for a few hours before serving so that the sauce imbibes the spiciness of the chill flakes well before serving. Otherwise you will end up with a predominantly sweet dip, which does not deliver the required effect. A Thai dip that partly resembles the meetha chutney so commonly used in the preparation of chaat in India. The sweetness of jaggery and the sour flavour of imli combine well, resulting in a delectable Sweet and Sour Dip that goes very well with nachos, papdi and other crispies.